Weather, the passage of time and air pollution are having an effect on the gravestones in St Michael and All Angels churchyard. During the summer of 2004 a group of volunteers joined the History Group to begin to undertake the task of cleaning and recording the memorials. “The Marden Scrubbers” managed to tackle about 66% of the graves and decipher the inscriptions. These have now been transcribed and photographed for posterity. The remainder of the graves, as well as the memorials inside the Church, were tackled in subsequent years and the Scrubbers were augmented by volunteers from the Women’s Institute. A plan of the graveyard is and a file of names is available in the Heritage Centre, also photo’s and full inscriptions of most gravestones. 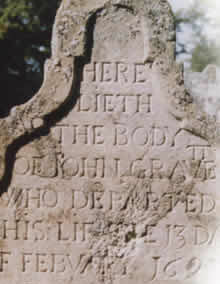 Details of the inscriptions can be found on the St Michael and All Angels Church website.